Author Mark Schonbeck of the Virginia Association for Biological Farming and OFRF Research Program Director Diana Jerkins will review the most recent research on soil health practices and explore how organic growers can build healthy soils on their operations. The webinars will provide practical guidelines for growers, in-depth analysis of research outcomes, and an opportunity to get your questions answered. Description: This webinar will examine the functions of the soil food web and key components thereof in promoting soil health and fertility and sustainable organic crop production. Research-based guidance on organic practices and NOP-approved inputs for improved soil food web function will be discussed. 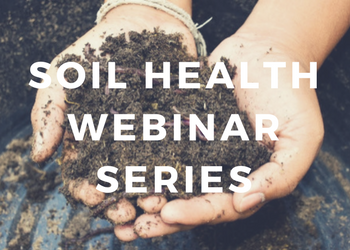 Description: This webinar will discuss the attributes of healthy soil, the central role of organic matter, and how to monitor and enhance soil health in organic production. The presentation will outline key organic practices for building soil organic matter and optimizing soil functions in relation to fertility, crop yield, and resource conservation. Description: This webinar will focus on integrated organic weed management tools and practices that give crops the edge over weeds, build soil health, and reduce the need for soil disturbance. Description: This webinar includes the impacts of tillage on soil health, including practical, soil-friendly tillage practices for organic systems. We will discuss several newer tillage tools and approaches that reduce adverse impacts on soil life and soil structure. Description: This webinar will focus on selecting the best cover crops, mixes, and management methods for soil health, including crop rotations and cropping system biodiversity. Description: This webinar will cover plant breeding and variety selection for performance in sustainable organic systems, including nutrient and moisture use efficiency, competitiveness toward weeds, and enhanced interactions with beneficial soil biota. We will also discuss heritable traits that could directly benefit soil biology and soil health. Description: This webinar will focus on the role of soil health and organic soil management in water conservation and water quality. Description: This webinar includes a discussion of the role of soil health and the soil food web, including practical guidelines for optimizing crop nutrition, minimizing adverse environmental impacts of organic fertility inputs, and adapting soil test-based nutrient recommendations (especially N) for organic systems. Description: In this webinar, we will discuss the capacity of sustainable organic systems and practices to sequester soil carbon, minimize nitrous oxide and methane emissions during crop and livestock production, and enhance agricultural resilience to weather extremes. The presentation will include practical guidelines for optimizing the organic farm’s “carbon footprint” and adaptability to climate disruptions already underway.